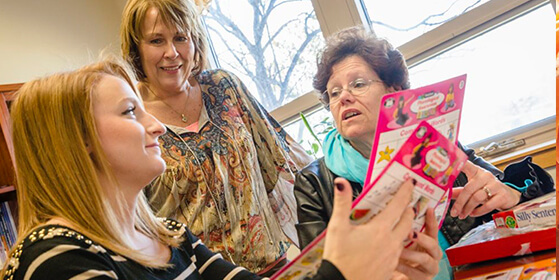 A student clinician finds her own voice while helping others speak and the different ways the Center for Speech and Language uplifts the community. Robin Arce ’06, ’16M had a solid job as a bank manager when she decided to make a change. She was restless for an opportunity that would allow her to help people, just as she had witnessed her parents do through their jobs at a hospital when she was growing up. A few of Robin’s friends worked in speech-language pathology (SLP) and, after researching it further, she soon found herself back at Monmouth University. Eight years after receiving her undergraduate degree, Robin enrolled in the Master of Science in Speech-Language Pathology program, a 60-credit, full-time, cohort-based graduate program. She was delighted to return to a school that she still felt was home. Robin was excited at the chance to facilitate hands-on therapy at the University. Once enrolled, Robin learned about Monmouth’s plans for a new Center for Speech and Language Disorders. The clinic became an integral part of her graduate experience at Monmouth. Barbara Miller, the clinical director, encouraged all the students to become involved with the clinic. They all contributed in their own ways, from setting up treatment rooms to developing programming. Part of Robin’s work at the clinic included creating a Facebook page to help attract clients and keep the community updated on progress at the clinic. “Working in the clinic, we have our own therapy rooms. We’re in full control over what we do in a session. And there’s an observation room, there’s intercoms … it’s a whole different experience to be in a clinic as opposed to being in a school with a very set curriculum,” said Robin. She originally wanted to work in SLP to help children, but through an assignment working with adults, she became comfortable with clients of all ages. Robin was assigned to adults with aphasia, a language disorder most often caused by a stroke that affects a person’s ability to speak. She said that working with adults helped her apply her skills in a new way, and she feels that her newly found desire to help adults will drive her career forward. Robin was assigned to work with Kathy, who had suffered a stroke three years earlier. Kathy had been to other programs, but her husband, Peter, was particularly pleased with her progress at the MU clinic. “The students are so energetic; he thinks he’s going on a play date. He says, “Speech! Speech!” He plays and the whole time he doesn’t realize he’s learning. From the time he started here until now, we have two-word phrases. He’s doing a lot of the rounding of his mouth better. He’s just really doing better. The students have so much energy, and you can tell they’re so well educated. Barbara is absolutely phenomenal. I couldn’t really ask for it to be any better” – Danielle Dolan, mother of two-year-old Declan, who has a speech delay due to ear infections. According to the Bureau of Labor Statistics, the median salary for speech-language pathologist is $71,550, and they predict that 26,000 jobs will open up before 2022 due to the aging baby boomer population. The unemployment rate is 1.5% according to U.S. News & World Report. 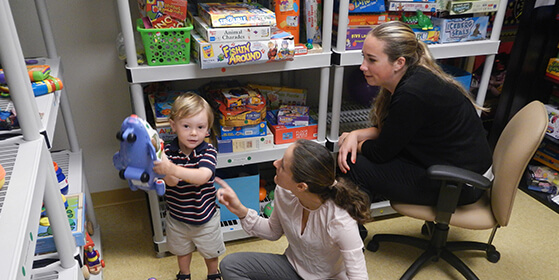 The SLP program is about more than just typical clinical work. The students teach patients through other types of non-traditional therapy, like baking, music, and tie-dying shirts. 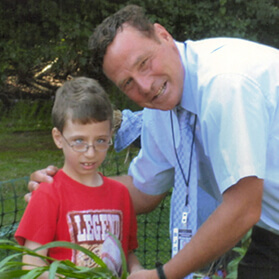 Students make sure that caregivers like Peter are also included. 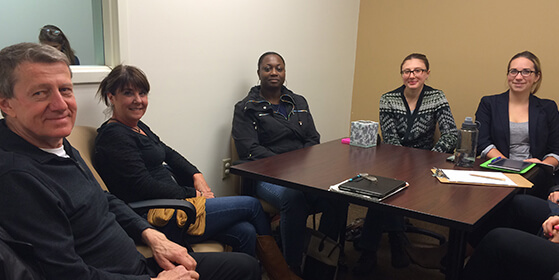 The clinic has arranged for structured group therapy, including bringing over students from Monmouth’s psychology department. The caregivers’ health and well-being is as important as the patient’s, and is too often ignored. Robin talks about the joy of teaching the “simple things” that most people take for granted. When Kathy began the program, she couldn’t say her address and telephone number, even though she had already been in therapy for two years. She would turn to her husband who would have to be her voice. She didn’t have confidence and felt that her words didn’t matter. Now, Kathy is able to answer that question easily, and Robin couldn’t be more proud. 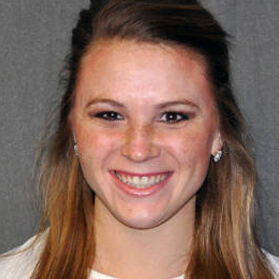 She gives credit to the guidance from the faculty and staff in the Speech-Language Pathology program. “The support, the drive, and the passion that the faculty has for this field and our success are just incredible. Barbara (Miller) constantly gives us opportunities to get other experiences so we’re not just limited to the textbook, the classroom, and the clinic. She’s built a ton of relationships outside of the clinic; we’re completely involved with the whole community,” said Robin. During one group session, Kathy surprised Robin by opening up about her feelings. “I feel very good about myself coming here. I’m learning so much from Robin; I wish I’d had her two years ago,” Kathy said. Not only did the words surprise Robin, but when Kathy started the program six months ago, she would not have been able to articulate that thought. “Just to see her progress…she has never said that type of stuff to me. That is probably a memory I’ll never forget,” said Robin.